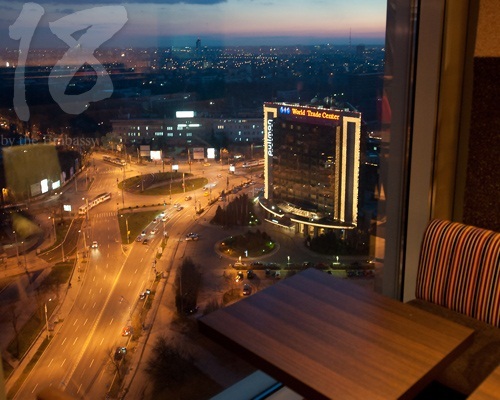 18 Lounge opened in Bucharest last December on the top floor of the City Gate South Tower, next door to the Pullman Hotel. As you enter the building on the ground floor you could be forgiven for thinking you are going to a business meeting. You begin by walking through the entrance hall of an office building, but as you exit the lift on the 18th floor all those feelings change. You move into a large lounge bar and restaurant playing soft background music and the vibes are good. There is a very long bar the length of the side wall and you walk in towards a view that is quite spectacular. This is the big selling point for 18 Lounge. There is excitement in this aspect of Bucharest. It is reminiscent of the feeling one gets when entering the Rainbow Room in New York or the Felix Bar in Hong Kong where atmosphere and view combine to produce something unforgettable. It can be enjoyed whilst having dinner or a drink. There is terrace outside which will be a great feature when the sun finally decides to show itself and in particular to watch the sun go down. The Ikea look of the furnishings could be improved upon. Bar stools would be a nice addition, as the well designed long bar makes the perfect place to sit and have a cocktail, entertained by the bartender. The cocktails are very good. My usual bench mark cocktail of a Cosmopolitan passed the test with flying colors. The menu is also very good offering a wide range of well priced International cuisine, and a buffet is available during lunchtime for a fixed price of 20 Ron. 18 Lounge is certainly a place to check out and should be a great success. I plan to make the most of their terrace over the summer months. MORE REVIEWS BY RICHARD FOX HERE.